Observations indicate that the dispersal of protoplanetary discs in star clusters occurs on time scales of about 5 Myr. Several processes are thought to be responsible for this disc dispersal. Here we compare two of these processes: Dynamical encounters and interaction with the interstellar medium, which includes face-on accretion and ram pressure stripping. We perform simulations of embedded star clusters with parameterisations for both processes to determine the environment in which either of these processes is dominant. We find that face-on accretion, including ram pressure stripping, is the dominant disc truncation process if the fraction of the total cluster mass in stars is ≤ 30% regardless of the cluster mass and radius. Dynamical encounters require stellar densities ≥ 104 pc-3 combined with a mass fraction in stars of ≈ 90% to become the dominant process. 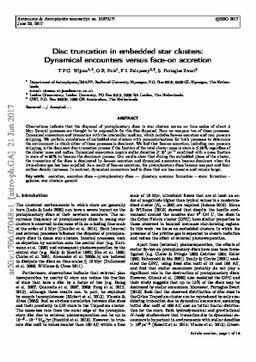 Our results show that during the embedded phase of the cluster, the truncation of the discs is dominated by face-on accretion and dynamical encounters become dominant when the intra-cluster gas has been expelled. As a result of face-on accretion, the protoplanetary discs become compact and their surface density increases. In contrast, dynamical encounters lead to discs that are less massive and remain larger.